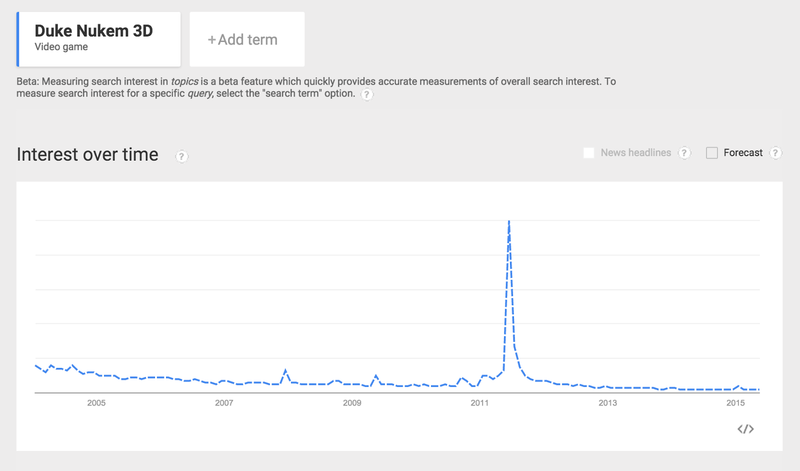 I read an article that referenced Google Trends showing that gamers were a fickle bunch. That particular trend showed interest in Angry Birds, Tetris, Farmville, and Candy Crush over time and compared to each other. This got me thinking: How could we use this with students? Oh, sure, I bet lots of people have come up with lots of ways, and most likely even in the ways I am about to discuss. 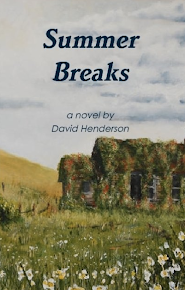 Well, be that as it may, my brain works a little differently than many folks, so join me on this ride, if you will. 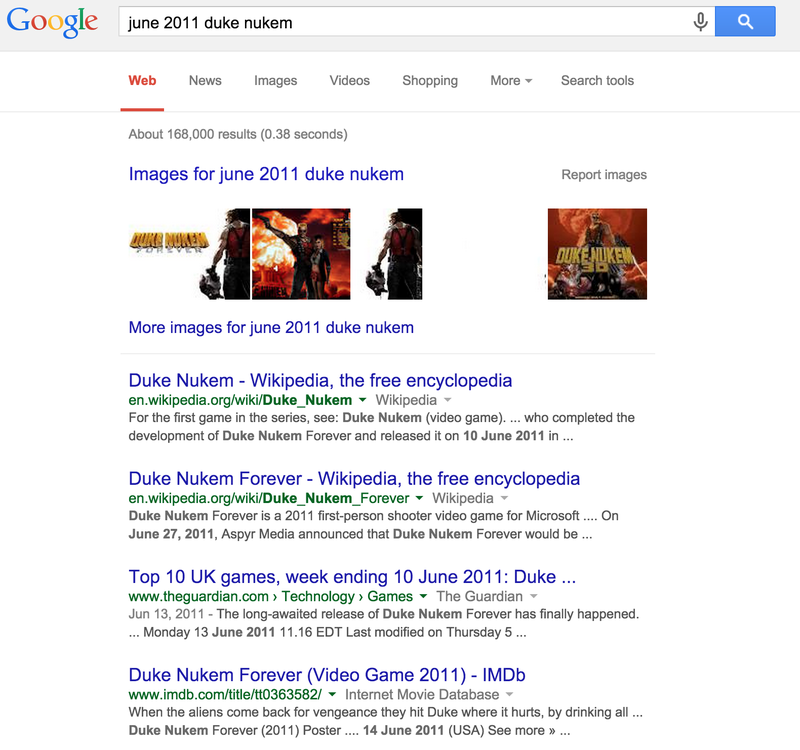 I took the video games idea and decided to focus on one particular franchise: Duke Nukem. Why? Because I'm a guy who grew up playing the originals and waited with baited breath for "Forever," only to be sadly, sorely disappointed. I started with Duke Nukem 3D. We see there is a spike in 2011. 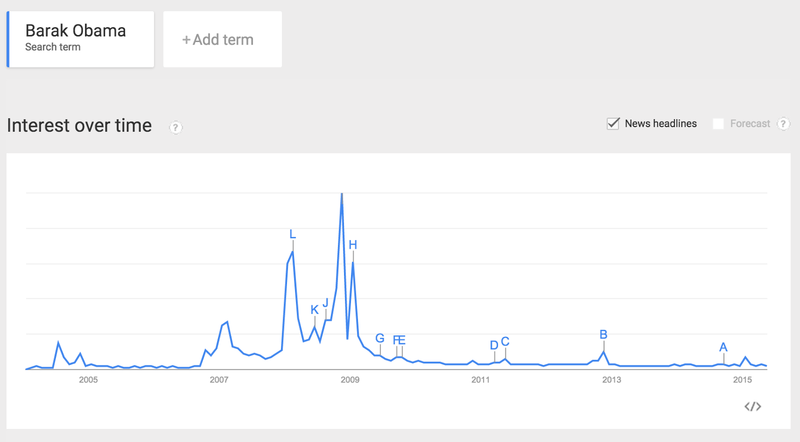 If I point to that in Trends, I see there is a lot of discussion in June 2011. Why? Ah! 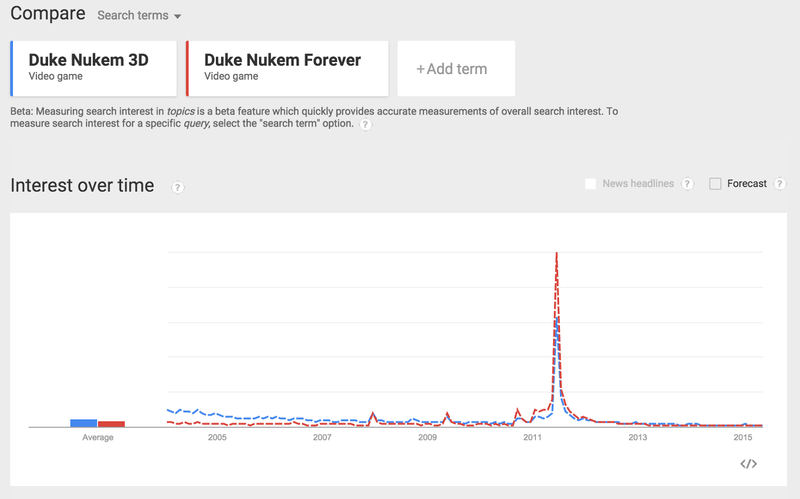 Duke Nukem Forever was released in June 2011, sparking interest in that as well as mention of Duke Nukem 3d. First of all, we see interest/news in 2004. What is that about? Students could research and find out. But, that's not why we're here today. Let's add another search term: XBOX. Why? Why not. Above, we see a couple of things: 1) XBOX is sought after much more than Obama and 2) XBOX has a pattern of ups and downs. 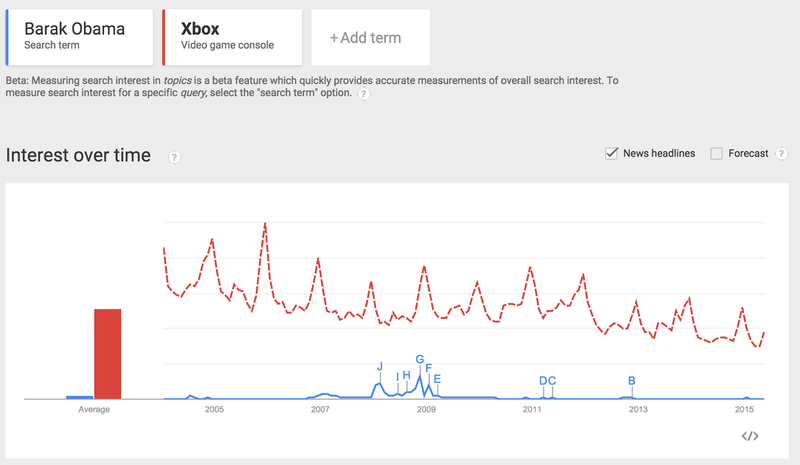 So now we ask students, "Is there a correlation between XBOX and Obama?" We follow that up with, "What is a cause for that correlation, if one exists?" But, wait! There's more. Let's add "donuts" to the mix. Again, why not? What do we see after adding donuts? Well, not much in the way of correlation. 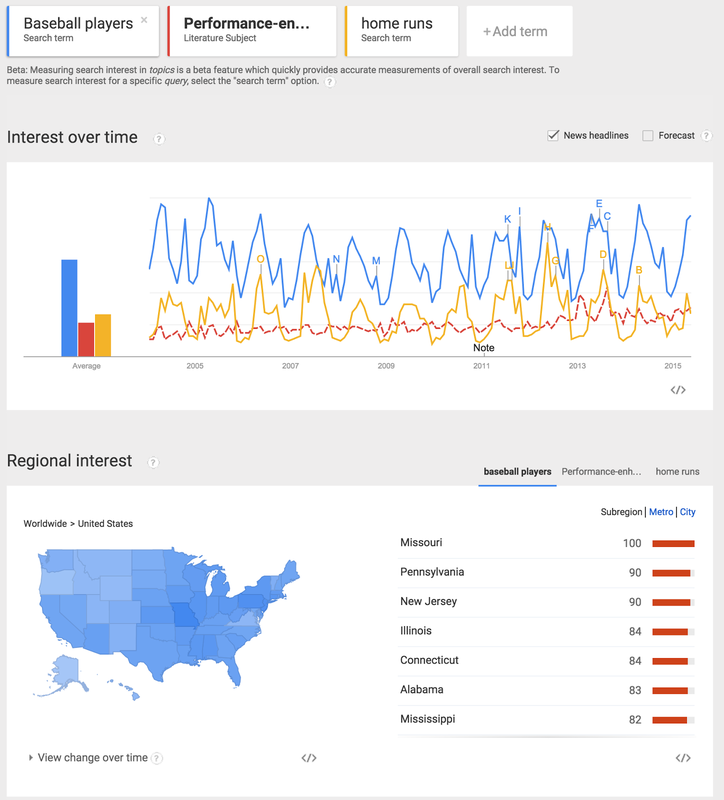 Donuts, for whatever reason, have been steadily growing in popularity among searches. Look at that chart again. Donuts have been increasing. What is the trend for XBOX? How about Obama? 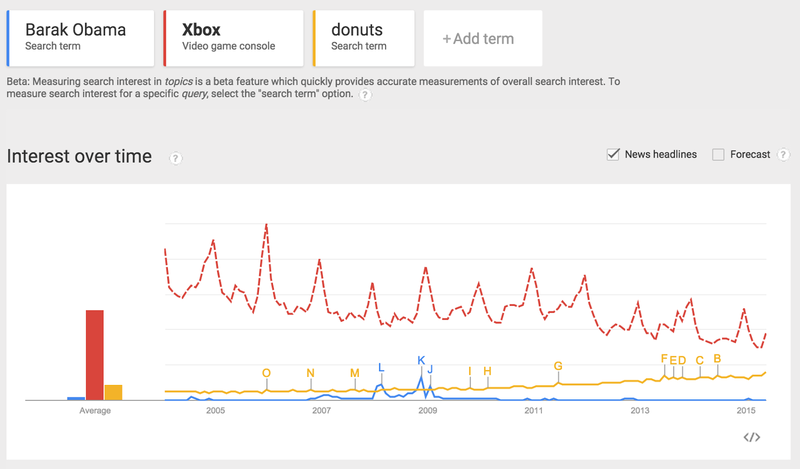 Is there any correlation to why donuts would be increasing as XBOX and Obama have been decreasing and/or plateauing? Have students speculate on such things. Let them be creative! Have them make up a reason why this is happening through a creative project that involves researching the terms, keying in on certain points of the trends, and then creating a fictional news story (video, article, etc) that ties it altogether. Here, I chose "baseball players," "performance-enhancing drugs," and "home runs" to see if there any correlations. Of course there are. You will notice, I included the "regional interest" section in the photo. One of the cool things about Trends is that you can show worldwide stats, stats for a particular country, or you could even choose a particular state (in this case). If you chose a state, you would see any cities that are pertinent to the searches. For example, if I choose Missouri, then I am presented with St. Louis, Springfield, and Kansas City. At any point, I can find high/low spots and then research the connections. Students could also make connections where the trends are NOT in line with each other. For example, in Dec 2012-Jan 2013, talk about baseball players falls off but PEDs discussion is high. Why is that? It is important to point out that Trends uses an "OR" approach. That is, none of the terms are linked so far as Trends in concerned. It is up to the researcher to convert the ORs to ANDs - or at least to attempt to discover if there actually are any ANDs.